So, I've been having a lot of problems with my internet in the evenings for the past few months. Every night it's the same issue, around 7:30-8:00pm I've been having high latency to various games(LoL, WoW, Overwatch), and web pages have been slow to load. Two technicians have visited, they found no problems with the cable inside my apartment, or outside. They replaced all of the connectors and barrels on the cable inside my apartment, but that didn't resolve the issue. The first technician also replaced my old modem with no resolution of the symptoms. 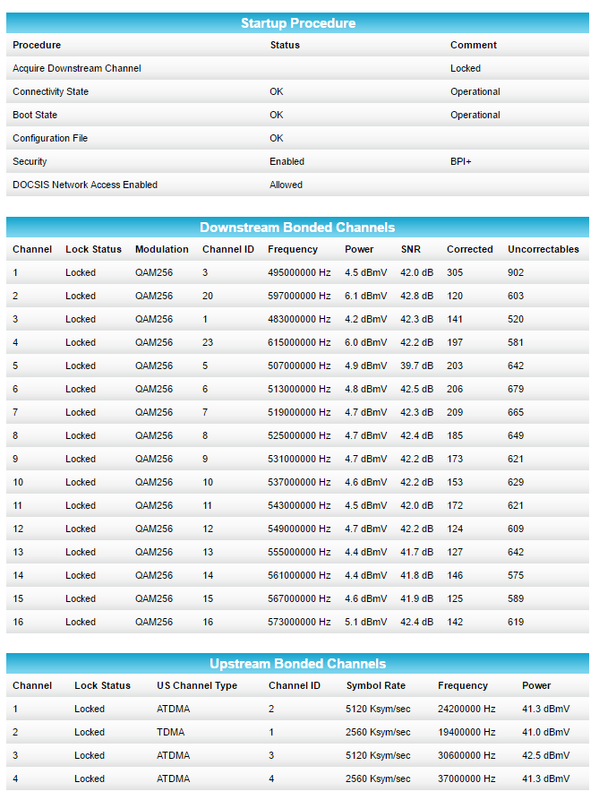 I then purchased my own modem(Arris Surfboard SBG6900-AC), and the problems are still the same. I spoke with the support staff for one of the games, and after showing them network logs they suggested that it was an issue with TWC routing and recommended I try a VPN. Using the VPN to a server in Chicago, my ping has been stable at 60ms. Just now, I was in a game where my ping was 200ms-300ms, and I turned the VPN on in the game with immediate resolution of the latency issues. In looking through this forum, I have noticed many other users from Central Texas who are experiencing the same kind of strange symptoms that I am. Below I have included the information requested in the sticky, and now I'm just wondering how I need to proceed in order to resolve this issue. I am not sure how it is wired outside of my apartment. Inside my apartment, there is a single coaxial cable from the modem to the wall, then to a second outlet downstairs. It goes into a single normal coaxial barrel, and then out of my apartment. There are no splitters inside my apartment. I have a Cat6 cable directly from my modem to my computer. There are no other devices connected. I am unaware of any changes outside of my apartment complex. The first technician to visit said the coaxial cable in the wall was bent and the connector was replaced. The second technician replaced all connectors on the cables and replaced the barrel. Connection problems are most noticeable in the in game ping. However, in the evenings web pages seem to be much slower to load although I have no way of measuring the extent of the delay. There are no background tasks running. How long ago did you reset the modem? If less than a day, the correcteds and uncorrecteds are way too high and indicate line problems. Twc is known to not admit to line issues. And apt buildings create notorious issues for coaxial connections. Next, you should only have 50 or 100 speed for gaming, too high a speed creates inconsistencies and varying latency. Are there any cloud sync programs running? How about the win 10 upgrade peer to peer sharing that microsoft runs? Post a cmd level tracert to google.comcopy and paste the signal page again without resetting the modem so we can see if there's a corrected increase. The modem was last reset 9 days ago. I suspect the corrected/uncorrecteds crop up when I turn on/off the VPN I use for gaming since this latency issue began. I had the 300Mbps for a year before the problems started, and since I'm an artist I like to have the faster speeds when downloading reference photos, and for watching things online. I'll have to consider reducing it if it might be an issue. There are no cloud sync programs running, I made sure to disable OneDrive. Only one of the computers I've seen the issues with is Windows 10, and the p2p sharing is disabled. The windows 7 and 8 PCs still exhibited the same problems. 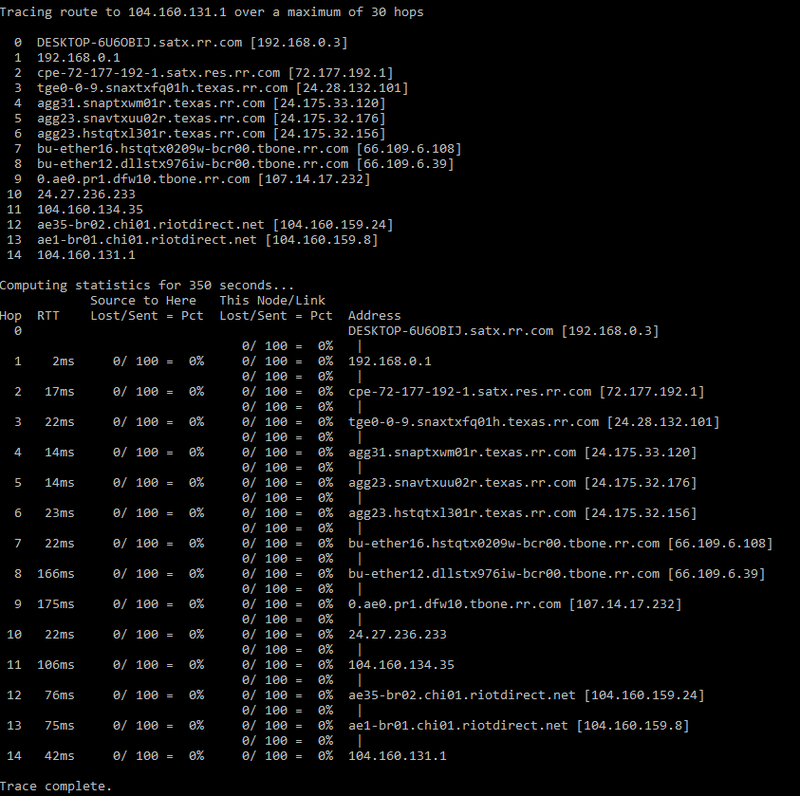 I have set the dhcp start to 192.168.0.100, and I will do a tracert tomorrow if/when the problems crop up again. The 24 DS channel assignment plan is rather extreme, spannng from 495 MHz to 616 MHz with a lot of channels missing in between the 16 actives for this modem. DS Channel 5 at 507 looks a bit noisy, but nothing else is jumping off the page. There have been several complaints in the last six months about the routing to LoL showing some intermittent high ping times during peak gaming hours. WinMTR has shown hardware capacity routing problems existing both inside and outside the TWC transport network. I wonder if there's serious ingress from 501 mHz.. broadcast ch 19... the s/n and correcteds get nailed from the next broadcast channel below them . I'd try to do a factory reset, get a new set of channels, hopefully in consecutive order, copy and paste them then check back in a couple hours to see if any are gone. Then get TWC out to fix the ingress points if that's the case. I have done the factory reset, and gotten channels 1-16. Will let it sit for a few hours and see what shows up. 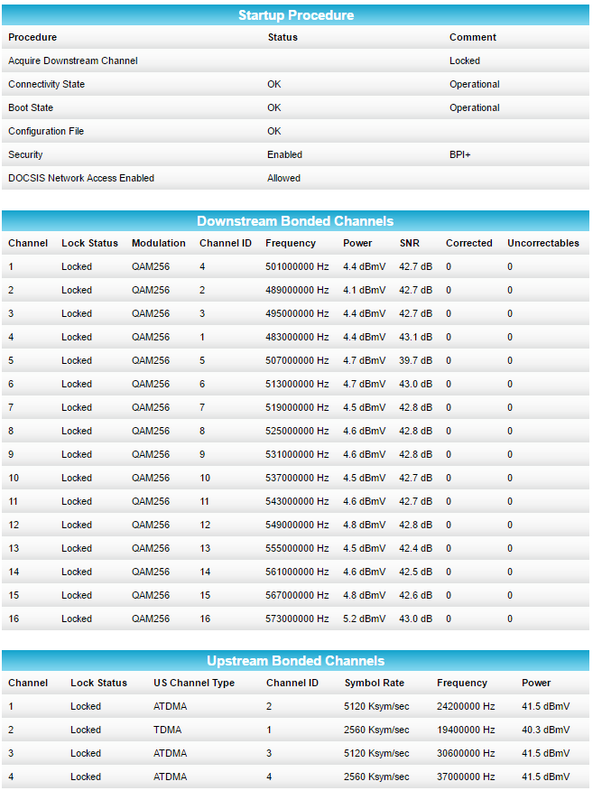 Here is the updated modem connection page after 3 and a half hours up. That log looks MUCH better. Wonder if TWC had a line crew working on something and tightened it down?? Otherwise the same symptom (high uncorrectable errors) might reappear, which points to an intermittent along the trunk line. 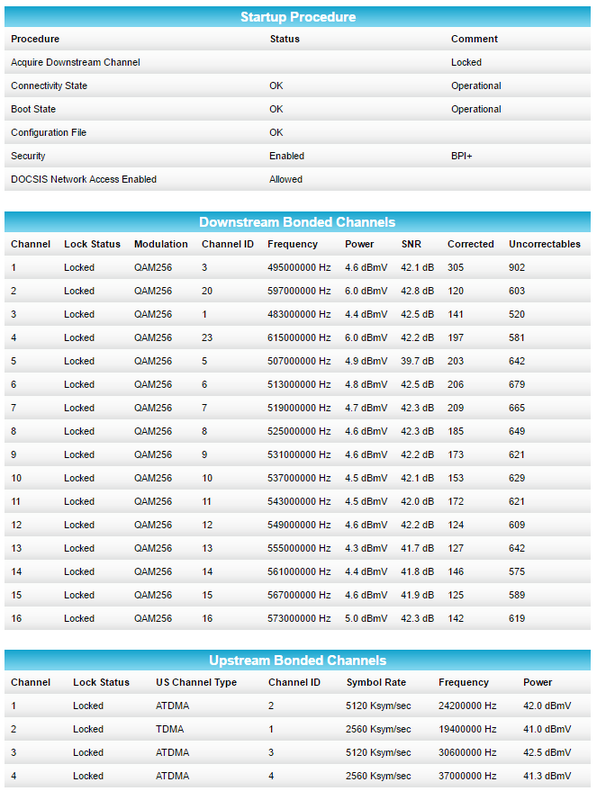 Now that you know what to look for in the signal logs, if the uncorrected counts and DS channel list both remain stable for three or four days straight, please mark as SOLVED. 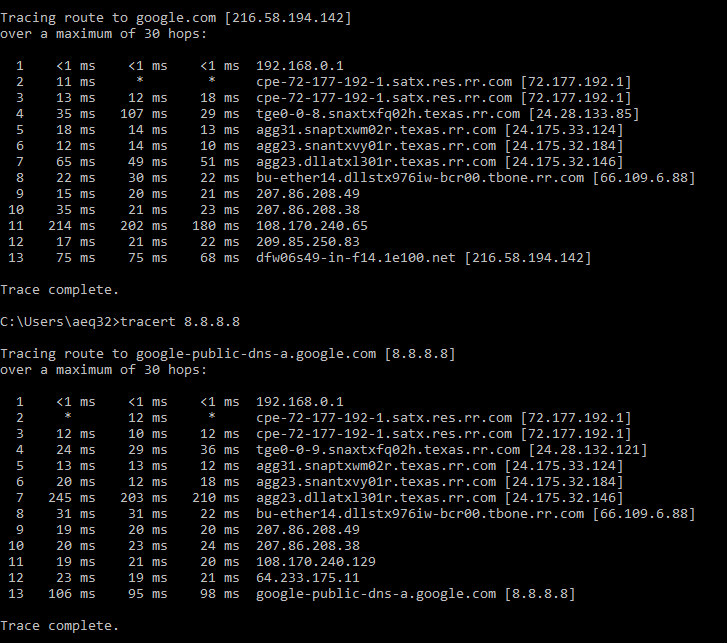 Router latencies are obvious in both tracerts. There's nothing an individual user can do about those except to complain to TWC, BBB, and the state and federal regulatory agencies. Will do. I'll keep an eye on it. Thank you very much for your help.